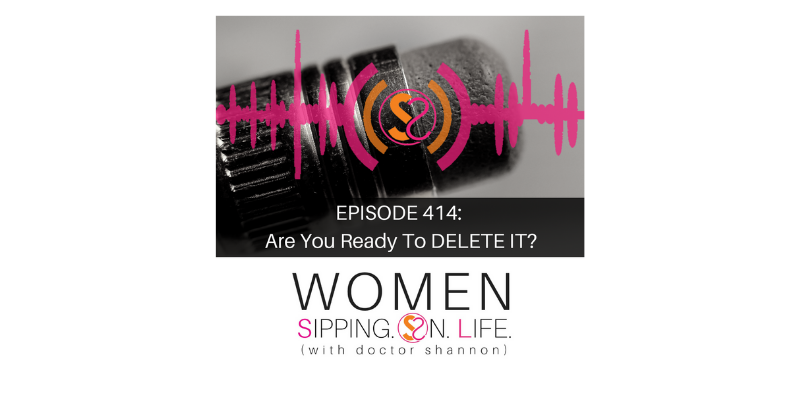 EPISODE 414: Are You Ready To DELETE IT? How often are you keeping things in your life that aren’t serving you or the greater good, and quite honestly need to be deleted? Today’s rant is exactly what you need to finally find the courage to take a stand for YOU, and let go of…DELETE…anything that’s eating you from the inside, out. What needs to be deleted in your life? If it doesn’t fit, feel good, serve you and the greater good…and/or it leaves you feeling like you’re not enough…DELETE IT!! Today’s the day to let it go. Write down what needs to be deleted in your life. Write it down. Circle it. Commit today. Make a declaration that you’re giving it permission to go. Don’t look back. Keep your eyes straight ahead. Keep moving forward.